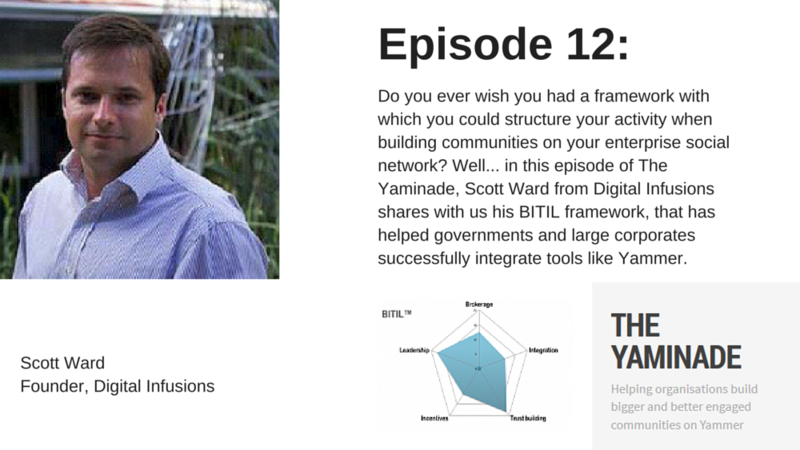 Scott Ward (@wardsco) decided to build that framework – BITIL. BITIL brings simplicity, seek structure and focus to social media undertakings that can be used to measure and assess the activity and quality of communities; build strategies and drive community engagement toward specific business objectives. experimentation and research the BITIL Framework is founded on the five key elements and over two-hundred and seventy sub-indicators common to high performing social media communities. Scott founded Digital Infusions in 2011, and now works with Governments and Large Corporates across Australia to help them unlock the value of Enterprise Social. We recorded this conversation in a VERY noisy cafe whilst Scott was visiting Brisbane – apologies for the background noise. Considering how noisy it was when our impromptu podcast recording occurred, it is a reasonably clear episode.